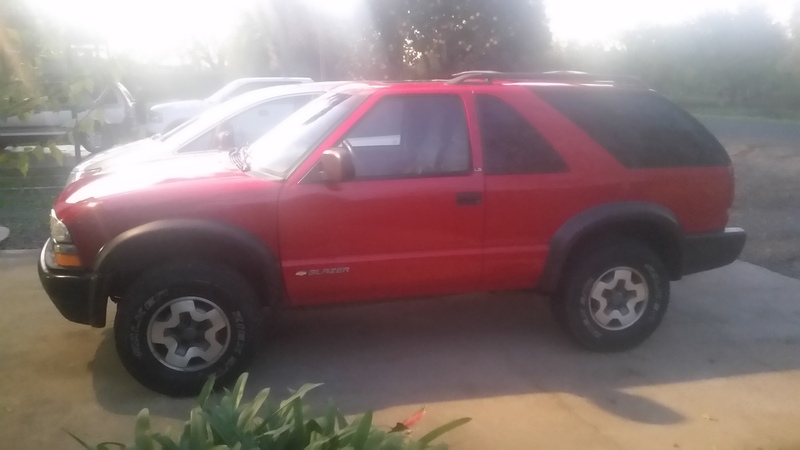 Meet my Blazer. This is actually my second one, the first was a 4-door I used for work. I fell in love with it, but needed a truck to pull our 5th wheel camper. 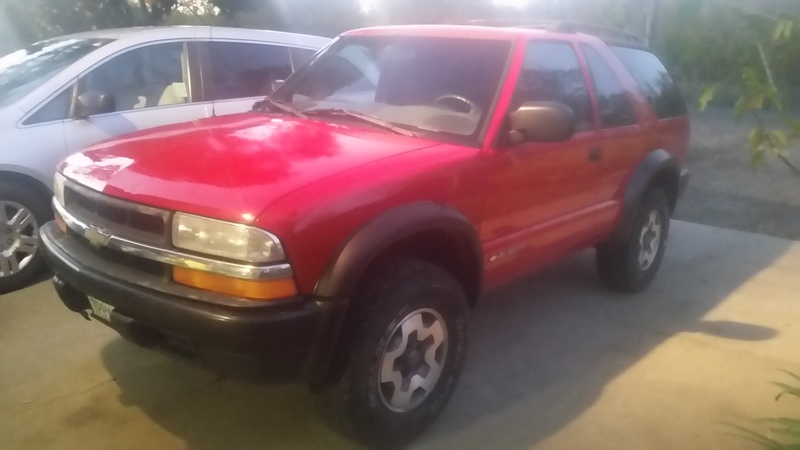 So, when my daughter turned 16 and I found this 2-door, how could I resist? Mom wasn't exactly thrilled when I brought it home unannounced, kind of like when I brought home our last dog, and the plasma tv, and my truck too (seems like a reoccurring theme) . Anyway, first thing was to upgrade the stereo and use some weather stripping to silence the many rattles in the back panels. Next is the tires. I'm going to stay with 31", which it has now, but I'd like them to extend outside the fender a little. I'm expecting to have to trim a little around the front fender because I'd rather not lift it. My real question is are spacers a good solution, or do I need to find different wheels? There are a couple things to consider here. The first would be to look at your local laws in regards to how far your tires can extend past the fender. Also, you can use spacers but I would recommend changing the wheels instead. your stock wheels have a 6" back spacing and something like an IROC or a Crager soft 8 which has a 4" back spacing which will put your front wheels around 2" past the fenders. I run spacers on my back wheels which brings them flush with the rear fenders. Also, adding track width to the front will shorten the life of your ball joints. You could always just remove the fender flares if you want your wheels to stick out. I don't know what the law actually is, but it is extremely common around here for 4x4's to be lifted and have the wheels out. There are even quite a few lowered trucks/cars with extended wheel bases too. No one gets stopped unless you are slinging mud all over the road. I'll ask my tire guy in town if he has any wheels with 4" backspacing in the used pile. I may get lucky and find something that looks decent. He'll be motivated to find some because he'll want to sell me some new 31's to go with them. It is a nice looking 2 door. I had 2 sets of wheels that stuck out around 2". I got rid of them and got some 16" firebird wheels (they the same back spacing as stock wheels). Since I have a 4 door I couldn't find any ZR2 style flares and I hated the look of the flexy flares that I had. Thanks, she is a cute little rig. I bought it on craigslist last Feb. Just recently it was really bogging down when you gave it more than 2/3 throttle. So I changed out the spark plugs, cap, rotor, fuel filter and used a couple cans of seafoam for a couple treatments. Now it's back running great again. I didn't replace the air filter because I'm about ready to pull the trigger on a new cold air intake. Before doing that, I want to better understand why a new intake is going to be better than the old one. Any experience with that? ^^This. I wouldn't waste your money. I had a cheap eBay cold air intake only because my factory air box had a big hole in it. I finally switched it back over to a stock box from a junk yard and now the cold air intake is sitting in a box in my basement. In with the New Year and out with an old problem! A couple of nights ago a friend calls me and lets me know my daughter's car won't start. He says he thinks that it's not getting any gas and asks if I've had any problems lately. Umm... well, depends... maybe. Flashback to 3-4 months ago, my daughter tells me that the Blazer is really "slow" in the morning. I test drive it, and true, it's bogging down at 2/3 throttle. So easiest first, I run some sea foam through the intake using the vacuum lines 3 different times on different days. That really improved the performance for a couple weeks, but then the bogging down returned. So I decided to replace the fuel filter with great results! Problem solved... at least so I thought, until now. So, I went to my friends house the next morning to check out the Blazer. I pulled the fuel pump relay, bridge power directly to the pump and the fuel pressure gauge read dead zero. Having a Blazer is like a dream. Sometimes you're loving life and you feel like you can go anywhere or climb anything. Other times it's like you're running from a dark monster, but you can't escape. You try to run, but there is just no traction. Battling the Dark Lord becomes inevitable! I say bring it on! What's the fun of having tools if you don't get to use them. We dropped the tank, swapped out the old fuel pump for a new one, bolted everything back up and turned the key... Success! Then I dropped the Blazer off down at the school so Sissy could drive herself home after basketball practice. I walk in the house, we have some dinner, and my wife asks me if I can go down and pick up Sissy after practice. I say, no, she's going to drive herself home. Figuring I didn't understand the question, my wife asks me again, and I reply with the same. Then she says, what's she going to drive home in? The Blazer... I answer. You fixed it already??!! Yes, I am the MAN! Last edited by Sanman; 01-11-2017 at 07:06 PM. 1st off I think you are the man too for being able to drop the fuel tank with that attitude. And 2nd I might have to put that quote about owning a blazer in my signature it is so good nice work!